These products has been compiled by Ian & Pat Belmont and Tom & Libby Luke. Do you have someone buried in the Bendigo Cemetery? Do a search of the web site for Remembrance Parks Central Victoria and its online data base to find out. HTML Format for computer record via USB drive. The Bendigo Cemetery is the main cemetery of the five cemeteries in the Bendigo area and administered by Remembrance Park Central Victoria (RPCV). The latest project is the Raywood Cemetery with details on the Products page. 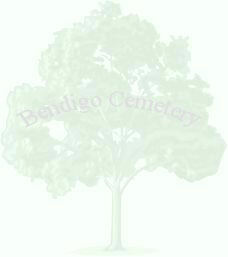 A USB product called “Bendigo & Regional Cemeteries” is available for purchase. This product contains the five main cemeteries of Bendigo (Bendigo, Axedale, Eaglehawk, Kangaroo Flat, and White Hills) plus regional smaller cemeteries like Goornong, Marong and Raywood, each photographed in 2015, along with Lockwood, Tarnagulla, Waanyarra and Runnymede (& Elmore burial List 1994). The latest project is the Raywood Cemetery compilation with photos, full burial list and a grave location map. The compilation includes detailed obituaries for most burials from the newspaper archives dating from 1865. These archives have formed the basis for a 117 page booklet called "LIFE, DEATH & GOLD IN THE WHIPSTICK". This booklet includes short descriptions, obituaries and stories, written in the 1860s, 1870s and later, by the correspondents of the day, describing life in the goldfields of Bendigo's Whipstick, centred on Raywood, Neilborough, Sebastian, and Myers Creek. More details are on the Products page, with prices and some upgrade options for people who have brought previous editions of our USB drives. The USB "Bendigo & Regional Cemeteries" is priced at $140 plus $9 for p&h for Australian mail addresses. There are 70,800 images and other information pages on this USB. This project has produced a complete cemetery burial list with hyper links to monumental headstone photographs. There are 130 monumental section areas in the cemetery, with 42,000 photos and notes with more details of some individuals for hard to read headstones, some listings of multiple burials in bigger graves and some information like occupation and last place of living. Bendigo Cemetery has 55,000 interments and this project incorporates a full burial list. The Lawn Cemetery sections were not photographed as part of this project but are included in the full burial list. Bendigo is 150 kilometres northwest of Melbourne, 225 metres above sea level and is strategically located at the junction of rail links in central Victoria. It’s the geographic heart of Victoria. The cemetery officially opened for burials in February 1858 and was gazetted in 1875. The Bendigo Cemetery is managed by the Bendigo Cemeteries Trust. The Trust was formed in June 1988 and amalgamates the former council cemeteries Bendigo, Eaglehawk, Kangaroo Flat, White Hills and Axedale. Originally the present Bendigo Cemetery was known as Back Creek Cemetery. Later Back Creek Cemetery was called the Sandhurst Public Cemetery. In 1892 the City of Sandhurst reverted back to being known as Bendigo and the cemetery duly changed its name to Bendigo Public Cemetery. Bendigo's Cemeteries are open museums telling the story of the regions development. Of the five cemeteries in the Municipality of Bendigo, the Bendigo Cemetery is the largest. The first registered burial was that of Ellen Mowbray Murphy on February 1, 1858 age 3½ years. Her headstone is now showing wear and a photography project like this aims to at least keep a digital record of these old sandstone headstones. The main Lawn Cemetery and Memorial Wall areas on the southern side of the cemetery will be photographed in a second stage to this project. That being said, there are still 42,000 images, 26 main pdfs and 135 web pages that make up this data set. • Select the Headstone Photographs page. Select the starting letter of the surname you are searching for. The burial list is set up in alphabetical order, or you can find the name much quicker by using the search window (Control & F). • A second search feature is to use the pdf file linked to each letter. This file has a continuous list of names for that letter. Use the search window (Control & F) find the name more quickly. A search hint for people in the same grave is to use the Grave # in the search box. Click the blue text link to display a headstone photograph. There is one overview photograph of each grave, with an additional close up photo of the headstone or plaque. Clicking on the photograph will in some cases enlarge it further. A few photographs were enhanced to help read the headstone. Notes from other AIGS records, when included, will help with unreadable photographs. Some additional notes/biographical details have been supplied for notable people buried in the cemetery. On this disk there are many links to web sites on the internet. An active internet connection is required to use these links. We suggest the data be copied to your computer hard drive from the USB, then keep the USB safe as your backup copy. To do this, copy the data much the same way as when you make an emergency backup copy of any disk. This is a very large data set and may take about an hour to copy to your hard drive. Create a desktop shortcut from the index.htm file to display the information in your web browser. Contact the compilers via their email address if you require more information about copying the disk. They will be happy to try and help. In 2007 the National Archives of Australia released 'A Gift to the Nation' – an online database of all the records of men and women who served in World War I. The idea behind 'Mapping our Anzacs' is to use place (location) based information to provide a new link to National Archives records. National Archives thought that a spatial pathway into World War I service records would make sense for local communities where, in many cases, a World War I memorial is central to the town and the community. A link to these records of servicemen who enlisted in Bendigo is here. This is a new project by the National Archive and the link is included on this USB for people who may not be aware of this new source of information. The Maps & Cemetery Layout page shows aerial photos of the cemetery taken at a low altitude, section area maps and lawn cemetery maps. Each map has a link to print to A4 size maps from the USB. The Other Disks and Products page lists other products made by the compilers. The book page is worth a read if loking for cemeteries in Bendigo. To purchase a disk, send an order via the compiler's email address and include your postal address. either bank transfer details, personal cheque or postal order.